In recent decades, indigenous people have displayed a new confidence and pride in their identity, using changes in the law at national and international level in order to defend themselves, their territory, and their culture, particularly against the extractive industries. They have been engaging with aspects of mainstream Western culture such as higher education and communications technology, reaching beyond the borders of their country in a struggle that is becoming increasingly global. Ayme Tanguila, Ecuador. ©Ayme Tanguila, 2018. Linda Etchart is a lecturer in Human Geography at Kingston University, London. She has taught at Birkbeck College, University of London, and Anglia Ruskin University. She was an editor at Pluto Press, and a programme officer for the Commonwealth Secretariat. Alicia Cawiya (vice president of the Huaorani people): interviewed in Quito and Puyo, Ecuador, on 16 and 20 August 2016 by Linda Etchart and James Thackara. Translated by Linda Etchart. Juan Ch’oc (Crique Sarco village): interviewed in Crique Sarco, Belize, on 14 October 2016 by Rachel Simon. Transcribed by Rachel Simon. 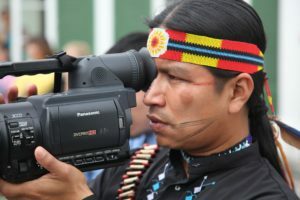 Eriberto Gualinga (Sarayaku Kichwa communications director/film-maker): interviewed in Sarayaku, Ecuador, on 20 August 2016 by Linda Etchart and James Thackara. Translated by Linda Etchart. Patricia Gualinga (Sarayaku Kichwa activist): interviewed in Puyo, Ecuador, on 24 August 2016 by Linda Etchart and James Thackara. Translated by Linda Etchart. Fany Kuiru (Tejedoras de Memoria): interviewed in Bogotá on 12 August 2016 by Gwen Burnyeat. Translated by Olivia Plato and Hebe Powell. Eva Sánchez (Las Hormigas): interviewed in Intibucá, Honduras, on 26 October 2016 by Louise Morris. Translated by Louise Morris. Ayme Tanguila (Kichwa architect and urbanist): interviewed in Quito on 27 August 2016 by Linda Etchart. Translated by Linda Etchart. Diamond, J. (2005) Guns, Germs, and Steel, 2nd edn, Vintage, London. Galeano, E. (1971) Open Veins of Latin America, translated from the Spanish by C. Belfrage (1997), Monthly Review Press, New York. Film. Crudo ('Crude oil'). Directed by Joe Berlinger. Red Envelope & Entendre Films. 1hr 44mins. 2009. English subtitles. 1st successful pilot Project for land registration in Crique Sarco Village, Toledo Belize implemented by SATIIM. Maya Land Registry. Wearne, P. (1996) The Return of the Indian: Conquest and Revival in the Americas. London: Cassell/Latin American Bureau. Philadelphia: Temple University Press. Casement, R. (1997) The Amazon Journal of Roger Casement. London, Anaconda Editions. Ramírez, M.C. (2011) Between the Guerrillas and the State: The Cocalera Movement, Citizenship and Identity in the Colombian Amazon. Durham: Duke University Press. Acosta. A. (2017) ‘Living Well: Ideas for reinventing the future’, Third World Quarterly. Vol 38, No 12. Sawyer, S. (2004) Crude Chronicles: Indigenous Politics, Multinational Oil, and Neoliberalism in Ecuador. Durham, NC: Duke University Press.